With today’s abundance of information - old, new and constantly expanding - you need help keeping it organized, understanding it, and most importantly, putting it to good use in your practice. Homeopathic information is growing exponentially; innovations in philosophy and methodology now coexist with a rich body of knowledge and experience. Our understanding is constantly evolving, and as a practitioner, you’re an active participant in the process! With RadarOpus we’ve created the indispensable tool to help you manage, assimilate, and apply homeopathy’s incessantly growing body of information to your primary task: helping your patients to heal! Homeopathic Information is expanding – now your Homeopathic Software can expand as well! 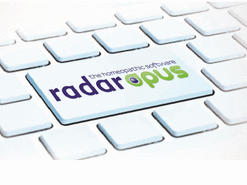 RadarOpus is designed to help you manage the information that is essential to every homeopathic practice. RadarOpus is redefining the boundaries between repertory and materia medica, making it easy to locate symptoms, unique phrases, even overarching themes…. in the widest possible variety of sources. RadarOpus is truly ‘individualized’, offering the widest possible range of homeopathic tools and information, readily customized to meet your needs and preferences. To get you started, we’ve created a range of packages and standard options. RadarOpus allows you to add your own notes to your library, as well as individual books and special collections. A well-rounded materia medica library is always a sound investment, but we understand that each practitioner is bound to have a few favorites that would normally be out of reach – available only in a larger 'package’. RadarOpus offers the flexibility of adding individual titles to your collection at any time. Seminar notes become manageable when you add them directly to your RadarOpus program, where they’re easily included in your extended searches, and annotated with links to relevant rubrics and materia medica references. Staying up-to-date is a task that’s ideally suited to your computer, and RadarOpus makes it simple. You control the amount and timetable for adding new information to your homeopathic software. ‘Set it and forget it’ means just that. Available repertory & materia medica updates – new remedies, a newly-indexed historical journal, or a proving – are checked to make sure they meet your pre-set criteria, and if so, they’re automatically added to your program; if not, you won’t be bothered by annoying update reminders! In case analysis, there’s a place where it all comes together: our evaluation of symptoms, our creative analysis, our research… Understanding and interpretation deepen, and we have an assessment and a plan. Which information sources do you depend on for understanding? Original provings & summaries, cured cases, toxicology, natural history and source information, classical texts, journals old and new…. With RadarOpus, our aim is to give you the tools you need in order to appraise and apply all approaches to homeopathy – to your work. Ever wished you could re-create your own thought process, or recall what led you to a brilliant (or not) prescription? Your case notes are centralized in RadarOpus, where a convenient search can bring it all back in just seconds. When it comes to case analysis, RadarOpus is the most versatile and flexible program available. Open as many analysis windows (clipboards) as you like - that's right - there's no limit on the number of different analysis windows you can open at once. Doing a follow-up visit? Open a series of windows from previous sessions to get an overview of your patient's progress. Want to look at your case from a variety of angles? Use standard analysis settings or perhaps apply a 'family' filter to one or more of the available windows and make a side-by-side comparison - the possibilities are endless! Running a busy homeopathic practice means keeping track of information - lots of it. RadarOpus is on your side - helping you keep track of all the 'bits & pieces' of each patient's case. Basic patient management tools are built into the program’s Single Intuitive Interface, which means saving case notes and analysis charts is all handled with a couple of mouse clicks. Imagine the time you’ll save, having all patient records saved and accessible in one place! It's easy to get caught up in the routine demands running a practice, so much so that we often fail to make use of some of the most useful features of our homeopathic software. RadarOpus has you covered, with short 'how-to' videos that are built right into the software!